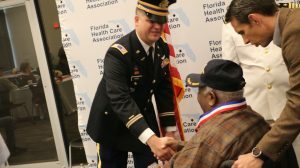 On Monday, November 12, FHCA held its annual Veterans Recognition Ceremony and Breakfast, with over 50 guests in attendance. 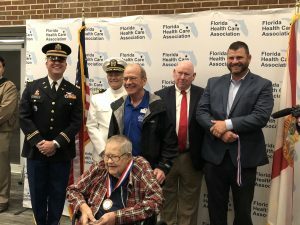 Watch our video and see photos from this special event, which included veterans from World War II, the Korean conflict, the Vietnam War, Cold War and conflicts in the Middle East for their service. 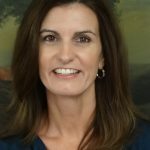 Residents from several Tallahassee area centers were in attendance, including Centre Point Health and Rehabilitation, Heritage Healthcare Center of Tallahassee, Madison Health and Rehab Center and Miracle Hill Nursing and Rehabilitation Center. 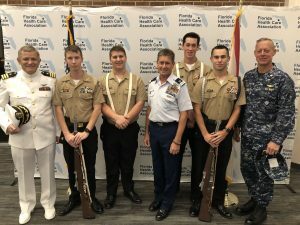 Special guests including Department of Elder Affairs Secretary Jeffrey Bragg, Commander Dennis Baker of the Florida Veterans Foundation (FVF), members of the Lincoln High School NJROTC and the U.S. Coast Guard Auxiliary. Everett Reed, son of FHCA Executive Director Emmett Reed and a junior at Leon High School, sang the national anthem. Guests received a FVF medal and challenge coin and a special gift courtesy of our sponsor, Medical Equipment Supplies of America (MESA).